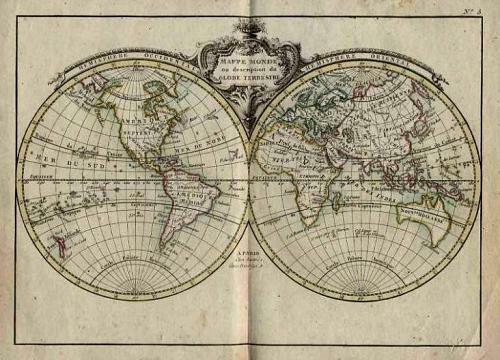 Mappe Monde ou Description du Globe Terrestre: A charming double hemisphere world map. Interesting features include the outline of Nouvelle Hollande taking shape (Tasmania is joined to the mainland). California has rejoined the mainland and the possibility of a North West passage seems to be in doubt. Amerique Septentrionale divisee en ses principaux etats: A classic outline of the continent with many unexplored areas that have been left blank. French and Spanish areas are shown alongside the nascent United States. Amerique Meridionale divisee en ses principaux etats: A well engraved chart showing many unexplored areas. L'Afrique divisee en ses principaux etats: Much blank space in the interior indicates to the lack of knowledge at the time. The title is in a decorative cartouche. The side table names the various provinces. L'Asie divisee en ses principaux etats: a crisp engraving with much detail. L'Europe divisee en ses principaux etats: some foxing at the margin but a neat and well engraved map of Europe just before the French Revolution. The maps have original hand coloring (outline and wash colour for the coastal shore and the border) and are printed on good quality paper. There are many decorative elements and much information is presented in the side tables. The North America, Africa, Asia and South America maps have tears at the bottom centrefold going 1" inside the engraved area. These would not be noticable when framed. Overall the set is in very good condition with only faint foxing or spotting.